A couple of posts ago I mentioned that I picked up a little paperback book from the check out isle and how it had quite a few tips on reducing your carbon footprint that I hadn’t thought of before. Just this morning while half asleep, for the very first time I was aware of how much water I was boiling for my coffee and the energy it takes to do so. I only boiled what I needed. That may be something that most people already do, but the truth is my kettle gets filled whether I am making a cup of tea, or a pot of coffee generally. Out of habit I just fill my kettle every single morning without thinking. From now on I plan on being more mindful of this. 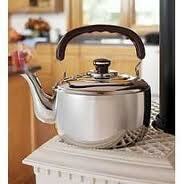 The little book says that completely filling the kettle for one cup of tea releases an unnecessary 125 cups of CO2. May not seem like much of a deal but every little bit makes a difference inlightening our Carbon Footprint. I”ll keep sharing new little changes I am making on my blog. I’m of course doing all the obvious things but there is always more we can do. August 12, 2010 in carbon footprint, energy, health, home, kitchen, mind the planet, mindfulness, resources, saving money, the earth, the environment. I love love love my computers. But their impact on the world? not so much..
← Resisting change. The ego mind.